Andrew is a recovering sports photographer. After covering the 2014 World Cup in Brazil for the UK national newspapers, he chucked it in and decided to shoot for personal enjoyment with a focus on landscape photography. 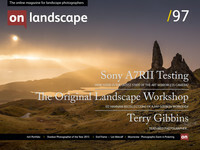 I am an amateur landscape photographer based in Edinburgh. As a biologist by training, I am passionate about the outdoors in general, and wild areas more specifically. As a keen hiker, much of my photography is done at higher levels in the Scottish Highlands. I was born and raised in Athens, Greece. By profession I am a Biologist. In the late 90′s I moved to California for my post-graduate training. Being able to experience some of the locations that inspired the big legends of landscape photography was key in my taking up landscape photography seriously. That interest eventually turned into a passion. In the last decade I have been living and photographing in Greece. My images usually focus on intimate views of the landscape, small fragments of a greater whole, that when put together, hopefully depict the “essence” and beauty of Nature in Greece. Our 4x4 feature is a set of four mini portfolios from our subscribers, each consisting of four images related in some way. If you would like to submit your own 4x4 portfolio please visit this page for submission information.